Below is the version history for the BSC Designer. If for some reason you need to download older versions of BSC Designer, check the version archive here. Please note: we support only the latest version. Please note: some features are available in PRO edition only. Check editions comparison chart for more details. Zapier integration released. The APP is in private state, so you will need this invitation link. Webhooks added to BSC Designer Online, BSC Designer PRO will support webhooks if team work is managed via BSC Designer Online. Learn how to use webhooks. “Save” function in BSC Designer Online was improved. The program will now manage the situations when the Internet connection was lost. Strategy map wizard released in BSC Designer Online. Instead of having two different initiatives “Remark” and “Comment” now there is one “Comment” that includes the functionality of old “Remark” (date specific comments) and “Comment” (comments that are not linked to any specific date). 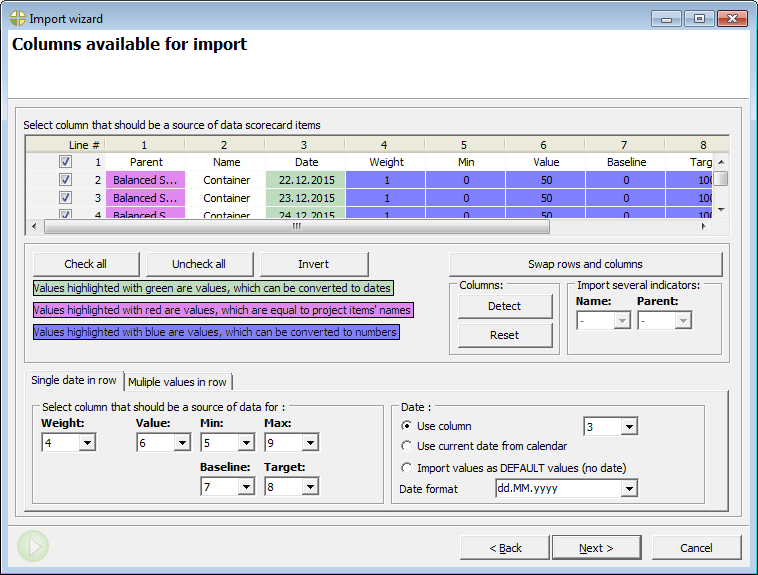 Better import from MS Excel spreadesheets. Check out the details in the new video. Scorecard and KPI sharing function updated. Check out the details in the new video. 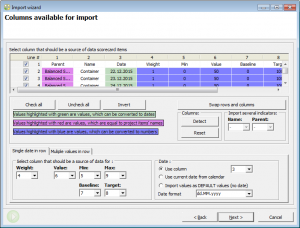 A new option that allows to specify how the software should treat dates without data: should it show inherited data (data available from the previous time point) or show only the data that was entered. The new option is available for each indicator in KPIs > Edit Values. The default value can be customized in File > Document Properties > Grouping tab. 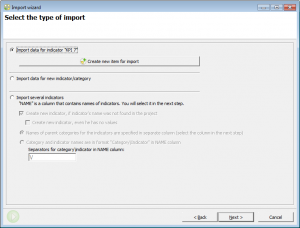 Import and export functions for Excel spreadsheets improved to avoid possible confusion by the indicators with the same name. Autosave feature for the projects added; users can adjust autosave interval in menu Tools > Application options > General. Cosmetic updates of some charts – update of “KPI Overview” chart; a legend added to the big version of the “Gauge” chart. Strict control over the selected update interval. For example: if a KPI’s update interval is monthly on 1st day of the month, and “permit input for only for update dates” checkbox is on, then the software will do what you want it to do – it will allow enter KPI data only into the dates allowed by update interval. If some date is not allowed by the selected update interval, then it will be marked by red color in the Values Editor. This is a version of BSC Designer that allows to have a view-only access to the .BSC projects created in BSC Designer PRO. Download it here. Easier management of the larger projects and larger organizational structures as KPI tree, business goals tree, and organizational structure can now fold and unfold. Ability to upload and add images to the strategy map. Version 8.5. Release date: 21 June, 2016. The large versions of “Time” and “Bar” diagrams (those that we can when double click on small charts) now have “Show data labels” checkbox. The large version of “Pie” diagram now visualizes not just values, but the sector percentage. Better weight management for KPIs. The property “max weight” was removed; now the software finds out the max weight automatically. Newly calculated weights will coincide with weights calculated when “max weight” property existed. Respectively, “Balance indicators” button was removed as manual balancing is no longer required. Weight diagram was updated as well, now the values are presented in % values. “Accumulated value” column was removed, now all the accumulated is displayed when respective “group by” period is chosen. Spanish translation of both PRO and Online versions was polished. More flexibility with update intervals – modify update intervals in bulk, new “Update status” column for on KPIs tab. Easier to customize a stop-light: when customizing a stop light you will see not only performance, but value figures. More flexible algorithms for containers’ value, it now creates data for dates where child items have values. Multiple select for persons in the alerts and responsibility list. Easier Excel templates for your scorecard. 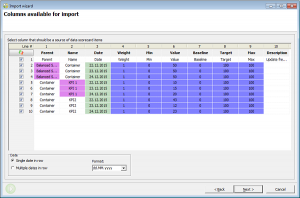 Prepare your scorecard in BSC Designer, export it into MS Excel spreadsheet, update data, and import it back into BSC Designer with updated data. “Overview” strategy map is now there. 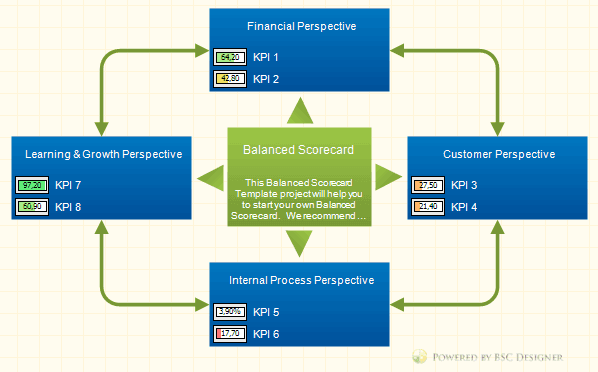 Like in PRO version, in Online one can create “Overview” map for KPIs and for business goals. 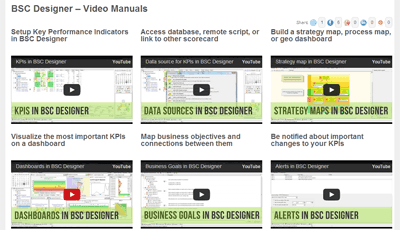 Dashboards from .BSC project are now fully supported in BSC Designer Online. View project dashboards and create your own online. Mobile devices with touch interface (tables and smartphones) are also supported. More flexible KPI data re-use. Now if you plan to re-use some of your KPI structure you can easily clear selected data from KPI. 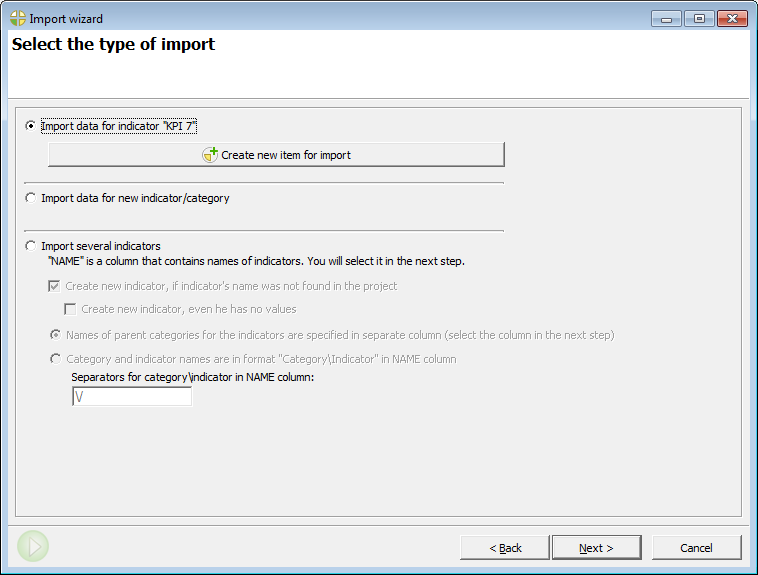 Name and weight of the imported indicator can now be customized according to user needs or can be taken from the source project. BSC Designer Online is now localized in Spanish, Portuguese, Arabic. Strategy execution cost can now be calculated with budget initiatives. Indicator’s weight can be a floating point number, e.g. KPI’s weight like 0.2 or 1.7 is now supported. A possibility to save strategy map in print-friendly high resolution format. Notification via company’s mail server. A possibility to send out notification emails and alerts via company’s mail server. The previous versions used an account in BSC Designer Online to send out email notification. With this version you can choose between using your account in BSC Designer Online, and using mail server of your company. Check out more details in Tools > Application Options > Teamwork. BSC Designer Online Server. BSC Designer Online can now be installed on company’s server. BSC Designer PRO can be seamlessly integrated with BSC Designer Online or Server. Possibility to clone strategy maps. Right click on “Strategy map” tab and select “Clone” option. 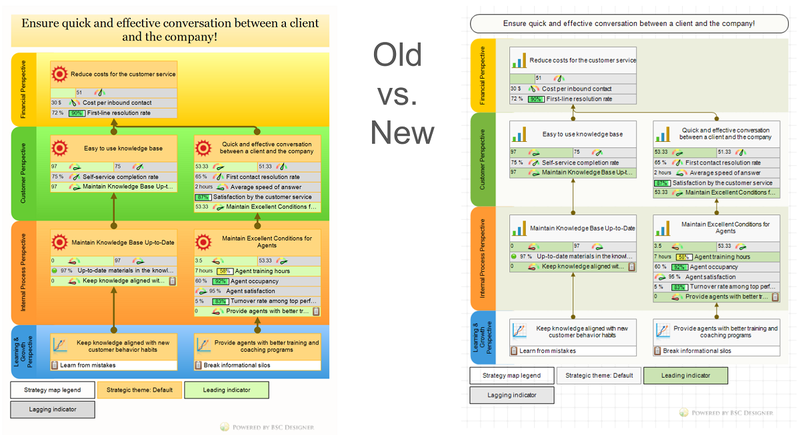 allows you to switch to a manual or automatic update of the strategy map preventing user from doing unnecessary clicks. allows you to specify a cause-and-effect link to a business goal in an external .BSC project. In Tools > Application options > BSC Online > BSC Online Site URL it is now possible to specify the URL to the online storage BSC Designer Online or a version of BSC Designer Online that is running on a local server. 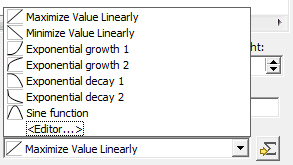 BSC Designer no longer requires the value to be between min and max interval. Simple Mode for KPIs. KPI in Simple Mode doesn’t have min and max properties. Baseline and target values will be used to calculate both progress and performance. Merge function in BSC Designer was released. It now allows several participants to work on the same project simultaneously. If upon saving project some conflicting changes occur, BSC Designer Online will suggest to resolve appeared conflict. SQL data source now supports :UpdatePeriodStart and :UpdatePeriodEnd parameters. Example: an indicator has a monthly update interval. Select October 2014, in the calendar in BSC Designer. If BSC Designer finds :UpdatePeriodStart and :UpdatePeriodEnd parameters, it will replace them with 1.10.2014 and 31.10.2014 respectively. The colors used on the charts can now be customized in Tools > Application Options > Chart colors. Initiatives can have a “Title”, if no title is specified initiative will use description or file name text. The list of initiatives now has “Show on map” column, if checked the initiative will be displayed below business goal on strategy map. Use “Move up” and “Move down” to change the order of initiatives. Bug fixed: strategy map printing and custom objects grouping. A KPI can now be a container for other indicators. Use it to summarize the values of child items. Learn more in the video manual. Learn more in the video manual. 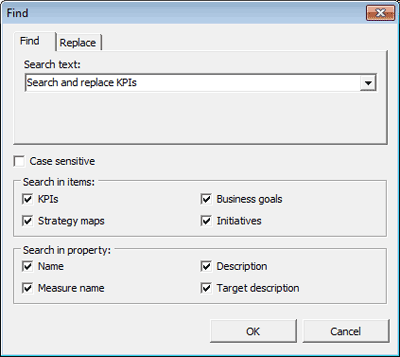 Target planning wizard now supports update intervals specified in initiatives. Columns in the “Analysis” tab now have a stop light background. Learn more in the video manual. Forecast analysis is now improved to show the interval of expected values for a time point. Learn more in the video manual. Business goals, KPIs, strategy map tabs redesign. Analysis tab added – allows to find poor performing indicators and indicators with highest absolute weight. Initiatives report updated with many features. New type of indicator to access XML and JSON formatted output, use it to access external data sources. “Business goals report” shows strategy map, all business goals and linked KPIs. “KPI structure report” shows all KPIs and their categories with details. Initiatives of “comment” and “remark” type can now be associated with diagrams. Initiatives are now displayed in reports. 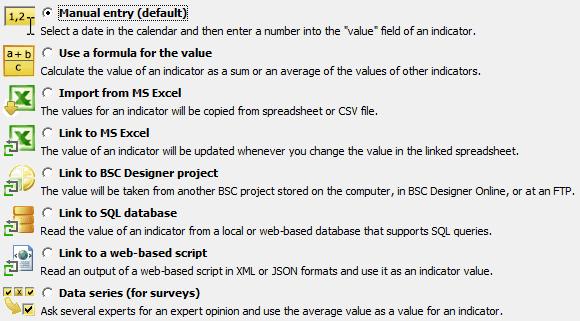 The long awaited Excel report is now available in BSC Designer Online. It is similar to what you have in a desktop edition. A .BSC project can be exported to an Excel spreadsheet where formulas together will your values will be used for calculations. Any HTML report can now be published to company’s FTP server. 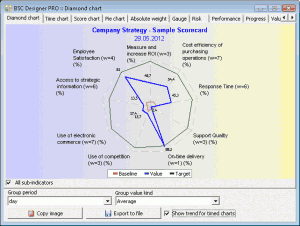 “Balanced Scorecard” type of the strategy map was improved. Now you’ll need a few less clicks to rebuild a strategy map. A Dashboard function is improved in BSC Designer. Now on a dashboard one can combine charts that depend on selected KPI and charts that are fixed to a single set of KPIs. Plan target values feature was added. It works similar to what we have in BSC Designer PRO. As in PRO edition, it is now possible to specify a case-and-effect connection between business goals. We have a very positive feedback from our old users about the latest update of BSC Designer. In version 7.1 you will find even more useful features for using a strategy map. 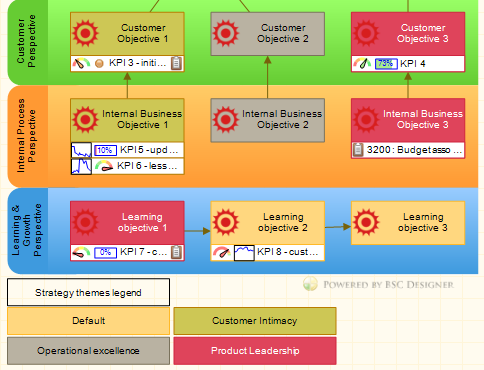 In 7.0 BSC Designer was able to create a strategy map automatically by using information about your business objectives and making an alignment between business objectives and KPIs. The result always looks nice, but in most cases it needs to be customized according to specific requirements. In the new version there is a “Pin” button that will fix the state of the object. The next time BSC Designer will rebuild a strategy map and it won’t change the position and the visual style of the pinned objects. This applies to business objectives, KPIs and links. In this way you can always use BSC Designer’s placement wizard to automatically put all of the objects on the strategy map and customize the map according to your needs. BSC Designer will remember the customization for pinned items and won’t change them during the next rebuild. 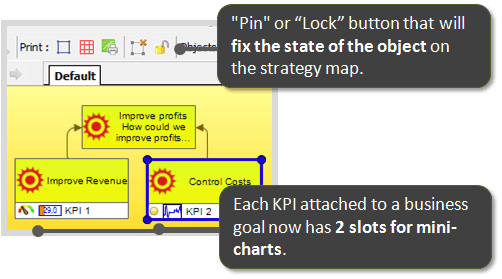 Each KPI is attached to a business goal and now has 2 slots for mini-charts. For example, you can use a stoplight and a progress baror a gauge diagram with a value chart. To customize these settings select a KPI that is attached to a business objective on the “Business Goals” tab and select appropriate charts and diagrams in the drop list. We changed the order of the tabs. We have changed the order of the tabs below. Now the first tab is “Business goals,” then you have “KPIs” and then is a “Strategy map.” It looks like a small cosmetic change, but it is really important as the Balanced Scorecard starts with business objectives, not with KPIs. In the previous version we had a fixed default dashboard that displays data for the selected KPI and adds a possibility to add custom dashboards for specific KPI items. In the latest version you have a single dashboard where you can add diagrams and charts according to your needs. For example, you can add a “Performance” diagram for a specific KPI. And you can add another “Performance” diagram that will display the data for the KPI selected in the list on the left. Cause-and-effect links supported. Now if you choose a business goal you can specify what this business goal contributes to. Business goals are now multi level, in older versions you could attach KPIs only, but now you can attach an initiative document to a business goal as well. Build a strategy map for the Balanced Scorecard. 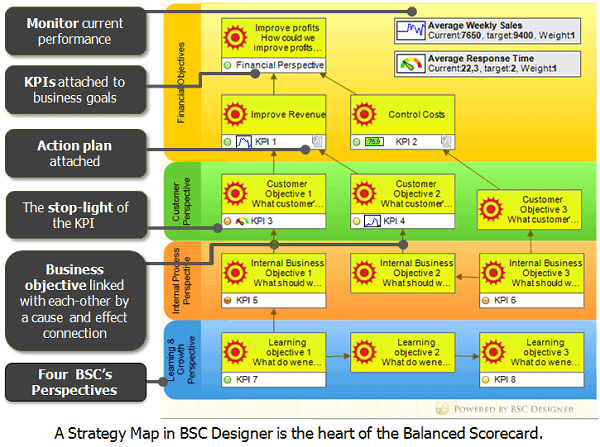 BSC Designer can now build a strategy map for the Balanced Scorecard automatically. It creates first level perspectives and places them within the business goals. It uses cause-and-effect links between business goals and connects them accordingly. There is a new formula button next to KPI target field. It allows to plan value growth according to your strategy. Alerts. There are new tab Alerts. They are used to send out notifications about important changes of KPIs. To enjoy this feature you need to have a BSC Designer Online account as BSC Designer Desktop uses it as a mail server. Placement wizard is updated. Strategy map placement dialog was updated. The most popular placement styles are now on the main tab now, and you can still use other placement styles, and they are on the “Others” tab now. On the “Strategy Map” tab you will find two buttons that allows creating a few business goals and assigns a KPI to them. In this way you won’t need to switch from a strategy map tab to business goals just to create a new business objective. Business goals with KPI. 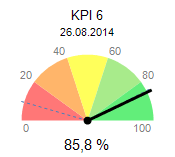 BSC Designer will show KPIs linked to business goals automatically by adding a KPI line under the business goal body. This is especially useful if you want to use the strategy map of the Balanced Scorecard as a hybrid of a dashboard and a scorecard. 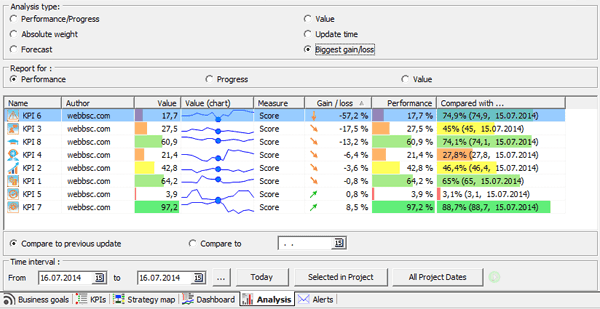 BSC projects with ready-to-use KPIs included: HR KPIs, Employee Engagement, 7-S Framework. Version 6.9. Release date: 14 October, 2013 – the full support of storing your projects in BSC Designer Online. 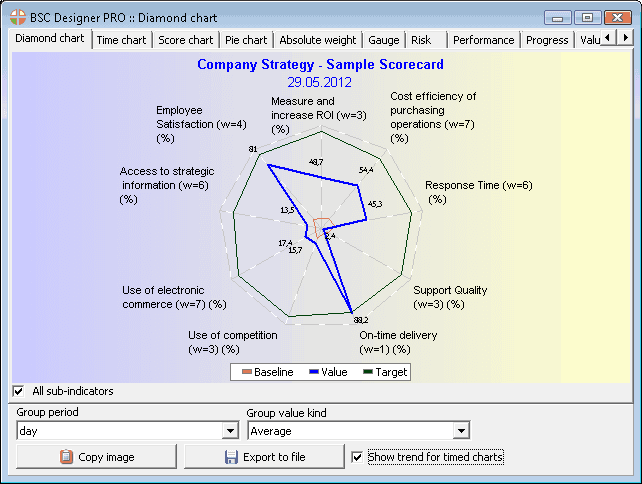 Support of strategy maps designed in BSC Designer Online. Version 6.8. Release date: 14 June, 2013 – full integration with BSC Designer Online. To access new features click “New imported indicators” button on the toolbar and go to the “BSC Online” tab. BSC Designer (desktop) is now able to connect to BSC Designer Online. You can store your projects in online version, view and edit them online and when advanced editing is needed you can check out the project with BSC Designer PRO (desktop). To use new function select Check in or Check out options in File menu of BSC Designer PRO. Possibility to add custom icons to KPIs or choose any icon from BSC Designer’s library – this allows to make your Balanced Scorecard visually appealing and give it professional look. Select KPI, find below “Name” edit box, next to “Name” there is an icon. Click on it to change it. Version 6.5. Release date: 21 February, 2013. Strategy map preview for better Android integration. Use check box “”Save graphical copy of strategy map in BSC project file” located in File > Document Properties > Main. Saved maps will be available when opening BSC file on Android device. Version 6.4. Release date: 15 October, 2012. Linking indicator to the value in Excel improved. Now BSC Designer scans Excel file showing available named range and match with indicator name. Now source cells in Excel file can be selected in a visual way. Access new function by selecting indicator and clicking “f” button next to the “Value” field. Business Goals tab improved. Now business goal and solutions have description. Initiatives can be attached to business goal or solution. These initiatives can be displayed in Initiatives report. Version 6.3. BSC Designer with values report. Release date: 23 September, 2012. Ability to link business goals to the map with KPI. Version 6.2. BSC Designer with even more flexible geo mapping. Release date: 25 August, 2012. Improved algorithm for GEO maps, now BSC Designer can automatically detect regions on the map. Initiative report added, now you can generate a report for all initiatives, as well as generate reports for the latest initiatives added or updated in BSC Designer. Version 6.1 BSC Designer with ability to link KPIs to strategy map. Release date: 7 August, 2012. Importing single values from Excel – now a user can click “Formula” button next to “Value” field to link certain KPI with some value in Excel file. Flexible wizard provides different ways to specify this link. Online activation of BSC Designer license is now released, as well as manual activation via email. Geo mapping. Ability to load map of the country or any other image and link KPIs to certain locations on the map. Read more in the online manual. Automatic update of baseline value. In Document Properties (menu File > Document Properties) you will find a new “Baseline” tab, where you can specify how the baseline value is updated. For example, a baseline can be set automatically equal to the value of the previous time point. Version 6.0 BSC Designer with mini graphs and charts released. Release date: 4 June, 2012. Version 5.9 Improvements in reporting and charts. Release date: 23 May, 2012. “Diamond” chart improved, now the chart will display information for categories with 1 or 2 indicators, as well as for the root category with many indicators. Naming of images in HTML reports updated, now file names are fixed, it will be easier now to integrate images from HTML reports generated by BSC Designer into 3rd party applications. HTML reports can now include company name, contact data and logo. Check Tools > Application Options > Company Info tab. Version 5.8 BSC Designer with budget initiatives released. Release date: 16 May, 2012. Now a user can select any indicator, click “Initiatives” button and add budget or time initiative. Also, there is a new report that shows each indicator with its budget and time initiatives, as well as calculates the total budget for the project. Read more about budget and time initiatives. Version 5.7 BSC Designer COM server released. Release date: 12 May, 2012. COM server allows flexible integration of BSC Designer with 3rd parties. Check examples in COM folder. Version 5.6. QR codes implemented to help users of mobile devices check reports online. Release date: 6 April, 2012. QR-codes in BSC Designer allow you to quickly read a link in any mobile device. Version 5.5. Google Calendar and Google Tasks integration. Improved PowerPoint Balanced Scorecard report. Release date: 11 February, 2012. Integration with Google Calendar and Google Tasks. Select any indicator or category, click “Initiatives” button. Now you can click “Add to Google Calendar” or “Add to Google Tasks” button. Improved PowerPoint report now includes indicator’s description, target, initiatives; indicator’s captions now change color according to stop-light color for the indicator in the project. Version 5.4. Advanced dashboard report. Now user can export custom dashboards to html report. Release date: 14 January, 2012. Version 5.3. New version with custom dashboard – users are able to add diagrams for any item to the dashboard. Release date: 26 December, 2011. Version 5.2. Strategy map for cascading projects + function to stop delegating indicators. Release date: 24 November, 2011. Version 5.1. Ability to work with data series is now provided. Release date: 7 November, 2011. Version 5.0. Custom measure units with text values are now supported. Release date: 30 October, 2011. Version 4.9. Link width on strategy map depends now on item’s weight. Release date: 22 October, 2011. Version 4.8. Enter data by months or years. Release date: 13 October, 2011. It is now possible to right click the calendar in BSC Designer and adjust it to enter data on weekly, monthly, quarterly, yearly basic. Data for charts can now be grouped by time period. Program can use for the time period the sum, max, min, average. Version 4.7. Indicator formulas. Release date: 11 September, 2011. Values of indicates can be calculated as sum of values other indicators. Some indicators can be ignored. Version 4.6. Indicators’ update control released. Release date: 20 May, 2011. Read more about Indicators’ Update Information. Version 4.5. UNICODE + Business Goals Manager. Release date: 01 February, 2011. UNICODE support, you will be able to type in your national encoding in BSC Designer, even if this locale is not installed in Windows. Version 4.4. Delegation of several indicators. Delegation of the value only or the full delegation. Delegation into existing project with indicators. Release date: 23 December, 2010. Version 4.3. Ability to delegate single indicators released. Progress bars and gauges added to the strategy map objects. Release date: 13 December, 2010. Version 4.2. Chinese localization, export function updated (parent column added), dashboard updated (it is possible now to customize the set diagrams at the dashboard). Release date: 8 December, 2010. Version 4.1. Analysis and forecasting released in PRO edition. Release date: 25 November, 2010. Version 4.0. Grouping data by time periods released in both – Standard and PRO edition. Release date: 1 November, 2010. Version 3.5. Risk diagram and risk reports, Strategy maps released. Release date: 25 August, 2010. Version 3.0. Strategy maps released. Release date: September, 2009. Version 2.0. 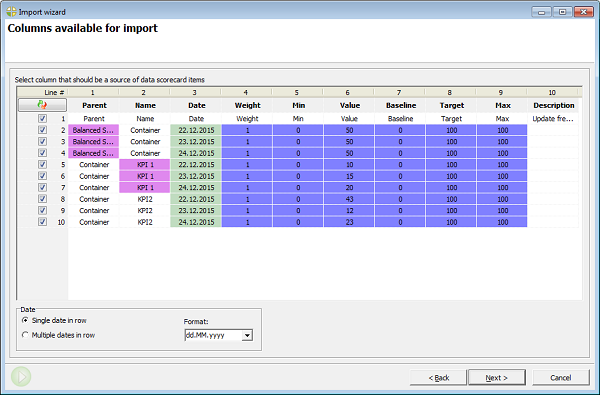 Custom formulas, SQL indicators, released. Release date: May, 2009. Version 1.5. Basic KPI Management and HTML report released. Release date: October, 2008. Version 1.0. Brand new release based on Strategy2Act software. Release date: September, 2007.